When I first announced the book review offer on my social media pages, I honestly didn't know what to expect. I didn't know if anyone would respond, I had no idea who would respond or what kind of books would be sent to me but the first message I received on instagram was from Michelle Bello. Michelle Bello is a weight loss coach and health enthusiast. Her book titled Look at Now encapsulates her weight loss story. It tells her journey from being an over weight child to finally shedding those extra unwanted pounds. 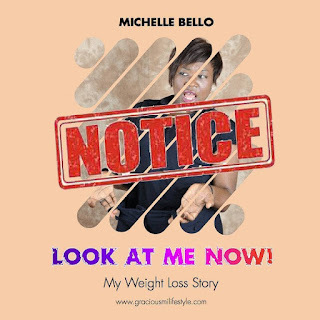 The book is filled with beautiful pictures which shows her weight loss journey and encourages her audience to see how far she has gone and how further they can go. At the tender age of six, she had inflamed tonsils but couldn't be operated on because of her overweight. Although she lost some weight while in boarding school and could finally undergo the operation, she soon regained way more pounds after she left the boarding school. Her book let's on to the fact that food is not the enemy but how we relate and interact with it that matters most. This EBook is absolutely lovely and was an easy read. Forty-three pages filled with lots of captivating graphics designs that you find yourself flipping through it and devouring the information it contains. It's target audience are those seeking the motivation to lose weight, and get into a healthier lifestyle. It's almost like an introductory guide that motivates you. The good news is that you can get this book for absolutely free. All you have to do is subscribe to her blog and a copy would be delivered directly to your mail.